On the cold morning of February 8, 2019, longtime Lincoln resident Shirley Rife, began the final trek of her journey home. The 92 year old wife of Calvin E. Rife Sr. was called home to be with her heavenly father. Shirley was first a loving wife and mother but she also worked for many years as a cook for Sigma Alpha Epsilon Fraternity at UNL where she mentored many young men. 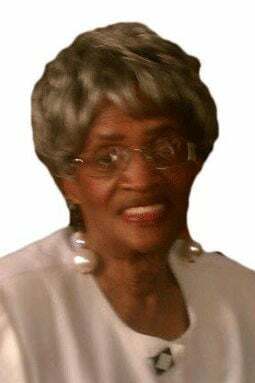 She was a long-time member of Quinn Chapel A.M.E., where she served in several positions. She also enjoyed travelling with her husband, writing, and honing her speaking skills as a member of Toastmasters Club. She made many friends over her lifetime. Shirley Nevels Rife was the final surviving child of ten children from the union of highly respected Lincoln citizens Fred Nevels Sr. and his wife Susan Crews Nevels. She was preceded in death by her husband; her parents; and her siblings, Fred Nevels Jr., Samuel Nevels, James Nevels, J.R. Nevels, Dorothy Bryant, Maddie Sue White, Frank Nevels, Joyce Crutchfield and a stillborn unnamed sister. The wife of Calvin E. Rife Sr. from St. Joseph, Missouri, she and her high school sweetheart had a happy family consisting of three sons: eldest son, Calvin E. Rife Jr., a retired Lincoln Public Schools teacher; Roger S. Rife, their middle son, who is also retired with many years' experience in education and business in Austin, Texas; and youngest son Michael A. Rife, a supervisor with the Lincoln Public Schools. Shirley leaves behind five grandsons: from the union of eldest son Calvin with his wife Janet Warkentin, sons Christopher C. Rife, M.D. (Ashley) and Brandon J. Rife and from the union of middle son Roger and his wife Kolete Graham, sons Shawn M. Rife (Shayne), Jason S. Rife and Justin M. Rife (Myla) all of California. Great-grandchildren: Jordan Rife and Aaron Rife of California; and Dylan Rife, Olivia Rife and Camden Rife of Lincoln.